The stones form an irregular circle, surrounding the taller stone in the centre. On one side of the small hill, an arm from the Atlantic ocean approaches, across a single-lane track. On the other side, a field, a small road and a few houses. Silence reigns: the only sounds come from softly-talking tourists, the nearby houses, the distant sea and the wind. A dozen or so hardy tourists wander around the stones. What each sees depends on how they look. Some take pictures on their phone, performing a modern ritual within the stone circle and its strangely off-centre burial mount. Others look in their mind and pay tribute to the lives of the ancient builders of 5000 year ago. But mist and rain are coming in and the people are leaving. One lingers to take a close look at the stones, before hurrying back to the semi-circular visitor centre. The stone circle is made from some of the oldest rock in the British Isles: the wet-grey surface reflects the deep mist of time. The silent stones have a story to tell. 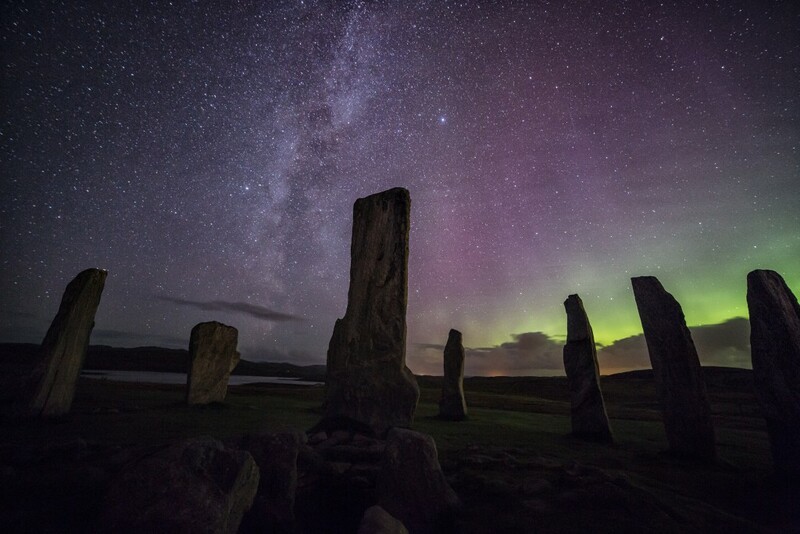 The standing stones of Calanais (or Calanish) on the Isle of Lewis are an arresting sight. Who put them here and why? The location is, ignoring its modern isolation, well chosen, a ridge at the end of a 10-km-long, northwest-facing but sheltered arm from the sea. The ridge gives a view of the horizon in all directions: an ideal place to see the settings and risings of the Sun and Moon. On the horizon, the low hills resemble a female figure, called the Old Woman of the Moors (Cailleach na Mòintich); sometimes the moon appears to rise from her body, but whether that had any relation to the monument is hard to tell. I have some doubt: the frequent cloud cover means that only regular events were worth looking for, mainly the solstices and equinoxes. The central stone is 5 meter tall; the 13 stones encircling it are smaller. 40 further standing stones are at various distances, leading up to the main monument, Nearby is grassland with a few houses. Beyond the houses the gras gives way to boggy peat and small lochs. There are more stone age monuments in the area, though none as impactful as Calanais. They have been dated to about 2500 BC. Someone later added a burial chamber to Calanais, presumably when its use was already in decline. Its off-centre position detracts from the simplicity of the original structure. Sometime after 800 BC the site was abandoned. Scotland and the Outer Hebrides. The area of the Lewisian gneiss is the northwestern part, west of the Moray Firth and the Great Glen, recognizable by the southeast-northwest orientation of the vales. Calanais is one of many stone-age monuments on the Hebrides, a series of some 500 islands off the Scottish west coast. Only some of the larger islands are inhabited. The inner Hebrides are closest to the main land, and the Outer Hebrides, also called the Western Isles, are further out. The largest of the Hebridian islands, surprisingly, has no unique name, in spite of being the third largest of the British Isles (the second largest is Ireland). The northern part is called the Isle of Lewis, and the southern (more mountainous) part the Isle of Harris, but there is no name for the whole, other than ‘Lewis & Harris’. The Isle of Lewis (or half-island) waivers between beauty and bleakness. The Outer Hebrides face into the Atlantic Ocean with all the storms and rains it brings. Erosion has stripped back the land to an ancient bedrock, on which rain and a climate mildened by the Gulf stream has encouraged gras and moss to grow. The weather can be wild. (The word ‘Lewis’ comes from ‘leog’ meaning surface water.) The east side of the island is milder, sheltered from the force of the ocean; here the Vikings had their preferred harbour. But they were not the first ones to come here, not by far. People had lived here for at least eight thousand years already. The main town on Lewis is Stornoway, the old Viking harbour, with some 8000 people. Fishing remains important here. The small-scale farming is called crofting, and the farmhouses are called crofts. Tourists come for the isolation, the monuments, and some of the best (and quietest) beaches in the world. But the presence of people is comparatively recent. During the ice age, this area was deep arctic and completely uninhabitable. A small ice cap was even centred on Lewis, 400 meter thick and extending to near St Kilda. After the ice age, as Europe recovered people began traveling up the coast, settling on the Isle of Man, the west coast of Scotland and on the Hebrides. That was by 7000 BC. These first people lived through times of rapid change. The sea had been 50 meter below current level, leaving the isles connected to the main land. But when the ice melted, the sea rose rapidly. The people followed a shifting coast as the sea kept rising and land became island. Genetic evidence shows that people first spread from a Basque refugia (an ice age holdout), following a coast line which at the time connected to Cornwall and Ireland, and up the Irish west coast to Scotland. Other groups traveled from Eastern Europe, along the major rivers. In the early neolithic, there was a very similar culture along the entire Atlantic seaboard. Stonehenge and Calanais were build by cultural relatives. The first people to come were coastal hunter gatherers. The sea provided them with food, but so did the land with nuts, berries and perhaps deer. Swans and geese may have been part of their winter diet. Farming supplemented the diet, perhaps brought in by the new arrivals from the east, and this became more important as the neolithic began and the nomads became more and more sedentary. The land had thus been occupied for thousands of years before Calanais was build. A smaller structure had existed within the region now occupied by the famous stone circle since perhaps 3000 BC. 500 years later, the circle and accompanying stone avenues were brought to completion. 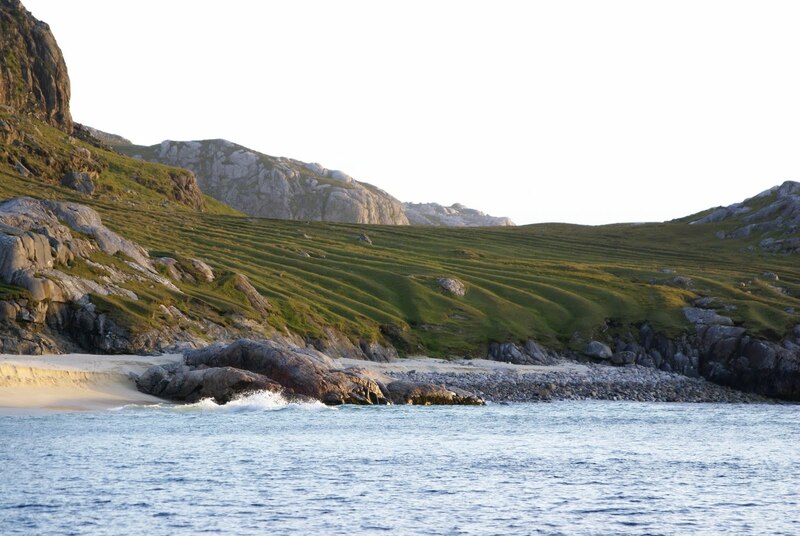 Calanais stayed in use for the next 1700 years, but the usage changed with the culture. At some time the central burial mount was added. By that time it appears to have lost its original meaning. And finally, after 2200 year of use Calanais was abandoned. Soon it became covered under the developing layer of peat. By 1800 AD, the blanket peat had grown to 1.5 meter in thickness and covered much of the stone. In 1857 the monument was dug out and the full structure revealed to the modern world. Why did people choose to live here, in such an unforgiving climate, and why did they leave? And how could they build such monumental sites in such a marginal environment? People living on the edge don’t have the resources to spend on large building projects. Calanais is often compared to Stonehenge, and although it is not at the same level of effort (and the stone was all harvested locally, unlike Stonehenge), it does represent a very large effort. Only a flourishing community could have done this. The secret to this thriving community lies in the weather. So soon after the ice age, you might expect a chilly climate, still recovering from the extreme cold. But this was not the case. 7000 BC, when people first settled here, was in fact a remarkably warm period. The temperatures had risen very fast after the last stirring of the ice age (the Younger Dryas), to levels higher than those of the mid-20th century. Not only was the climate in the Outer Hebrides warmer, it was also less wet. The climate allowed forests to become established throughout the Hebrides. The hunter gatherers lived in a very different environment from what it looks like nowadays, with extensive birch and hazel forests even on the west side of Lewis, and oak trees in the sheltered east. Times were favourable. But the good times did not last. 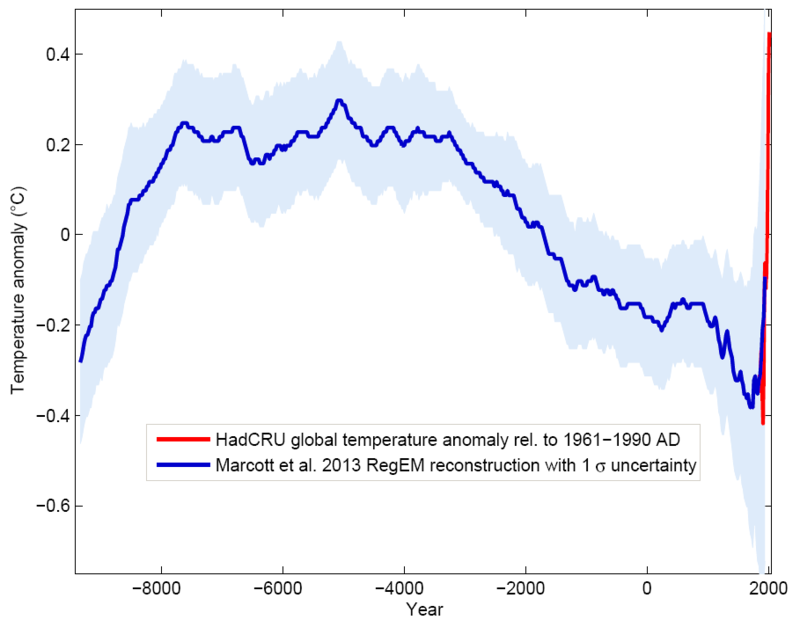 The climate started to cool, and by 2000 BC, had become 0.5C cooler than before. That sounds like a small change, but is not. It had a dramatic effect on the forest. By 6000 BC, the forest first began to contract, and by 2500 BC the island had become treeless. The land became not only cooler, but also much wetter, with more rain and less evaporation. The drip-feed of the rain killed the trees and caused blanket peat to grow. The grass land became moor a boggy, water-logged moss growing deeper by an average of 10 cm per century. Neolithic farming, whilst increasing the available food supply, was dependent on weather and soil. After a few centuries, agriculture could not continue in the deepening bogs. Life became more difficult, and the resources needed to maintain and use Calanais were no longer there. I imagine the last druid knowing the rituals of the stones waking up one morning to find his only apprentice gone. Finally, the last people moved away, to more hospitable areas further east, abandoning the stone monuments to a memory of better days. 0.5C was all it took to end a way of life. The reasons for the climate changes (which were global) are well understood, both for the warm period immediately after the ice age and the cooling which followed. They are related to changes in the Earth’s orbit. The cooling continued into the Little Ice Age (which really wasn’t so little, lasting 500 year). Only during the 20th century did the climate improve again, also for well understood reasons but now caused by human activity. The global warming quickly pushed temperatures back to where they had been during the Holocene optimum. But over the past two decades we have gone well beyond this and have entered uncharted territory. A change by 0.5C was the difference between a flourishing and a marginal community. We have no idea what a 2C change will do. More than that doesn’t bear thinking about: like the people who abandoned Calanais, many would become climate refugees, needing another place to live. The people of Calanais, and the Lewisian communities that followed, lived through momentous changes. Even over their brief centuries, the Earth changed and the change affected the way they lived. But for the silent, stationary stones, these changes were just the last part of a far longer journey. Their story goes back more than half the age of the Earth. 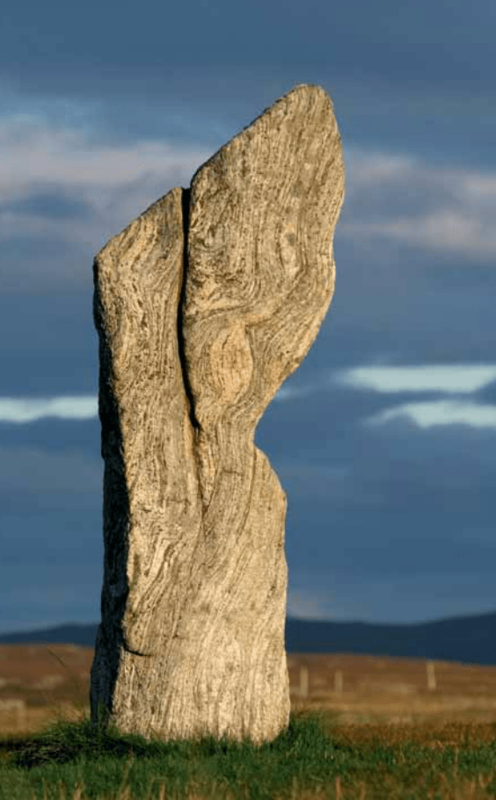 The stones which form the Calanais monument are truly monumental. They are Lewisian gneiss (the name giving a hint to the location), which is the oldest rock in the British Isles. Gneiss is a metamorphic rock: it has been subject to extreme heat and pressure, enough to partially melt and re-crystalize it. The original structure of the rock is destroyed and it becomes a mesh, with large crystals, but it retains the original composition. Gneiss can be made from a sedimentary rock (such as shale) or from an igneous rock (granite). The heat transformation is more important than the original raw material. The final product depends on the source material, the heat and the pressure. The pebbles in this rock have been stretched under extreme pressure. If there is high pressure but not much heat, rocks survive but are pushed out of shape. Fossils that have gone through this process come out recognizable but much more elongated than they were in real life, sometimes giving rise to hilarious reconstructions. Pebbles can become elongated, as in the picture below. At higher temperatures, the rock changes character. Shale turns into slate. Turn the heat up further, and the slate becomes phylite, schist and finally gneiss, in a sequence from a layered to a granular structure. Start instead with limestone, and you get marble. (geology.com is a good source of information on these rock types.) As the rock metamorphoses, any pebbles fall apart and become crystals embedded in the mesh. The formation of the Lewisian gneiss started 3 billion year ago. It began with an igneous intrusion, i.e. with magma that solidified underground to form granite. This granite became the main source material. 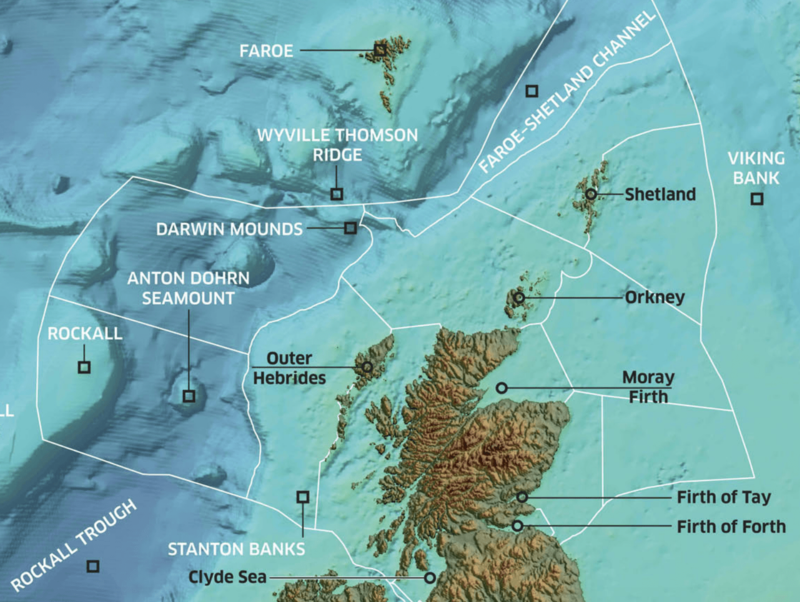 Different regions in Scotland’s northwest give slightly different dates for the original intrusions, ranging from 2.6 to 3.0 billion year: it is possible that northwest Scotland was not a single region initially, but was assembled from different crustal blocks with different histories. The composition of the Lewisian rock suggests that a small fraction of the intrusion came from melted ocean floor and the rest from hydrated mantle material. The combination of the two suggests that at the time this was a shallow-angle subduction zone. The metamorphosis into gneiss happened 2.48 billion year ago, in an event called the Badcallian. The structure of the gneiss and the pressure this required shows that it formed some 50 km underground, at a temperature of about 1000C. The depth exceeds the typical thickness of continental crust. Thickening crust and metamorphosis is a characteristic of mountain ranges, which is a good indication of a plate collision. The long time between the intrusion and the metamorphosis, up to 400 million year, shows that the mountain range was not caused by the original subduction zone, and was related to a different continental collision. This long ago, the continents may have been much smaller than they are now: the collision and its mountains may have been less like the Himalayas and more like the Alps although we don’t know this for sure. This far back, it is hard to know what collided with what. The Lewisian rocks are cut by a number of dykes, called the Scouri dykes. These formed about 2.4 billion year ago, while the rock was at a depth of 10-20 km. The Scouri dykes are a famous example of how younger rock (‘younger’ in a relative way only – it is still ancient) can become embedded inside older material. It is quite probable that their formation coincided with volcanism on the surface, but that surface is lost to us. The Scouri dykes are more prevalent on the Scottish main land than on Lewis. There may have been a second phase of dyke formation around 2 billion year ago. A bit later still, new magma was injected and granite formed, and a second phase of metamorphosis began. This is called the Laxfordian; it happened 1.74 billion year ago, although different regions may have had slightly different dates. There are indications that at this time there was accretion, volcanics, and shear motion. Lewis thus was resembling California in its geology. The Laxfordian gneisses date from this phase: they formed at a temperature of 600 C and a depth of 25 kilometer. Around 2 billion year ago, Lewis was embedded in a vast area which included the north of Scotland, the Baltic craton, Greenland and the Canadian shield, and possibly the North China craton as well. When this first came together is not well known, but the similarity of the rocks in these places is striking, and other places in these cratons show events around the same time as the Laxfordian. The Lewisian rock didn’t remain underground. Over time, erosion removed the crust above it and exposed the deep layers. The volcanoes which probably formed on the surface especially in Harris were gone, leaving no trace. As the years came and went, at times the land was uplifted, and at other times it fell below the sea. New sediments were deposited on top, a thick layer of sandstone, but although this layer survives in places on the main land, on Lewis it too has been eroded away. The Lewisian rock lived through the building of mountains, as continents collided, and through the break-ups which saw these mountains divided over different continents; it saw the volcanic events accompanying both. Oceans came and went; continents drifted, merged, and separated. The Grenville rocks, which lie below Central Park in Manhattan, and come to the surface near the Lawrence river and west of the Appalachians, formed near here, during the closure of a long-gone ocean, 1.1 billion year ago; worn-down remnants that once were the Himalayas of their time, now reduced to piles of rubble. The collision that caused the Grenvillian Himalayas was part of the formation of the Rodinia supercontinent. Lewis was in the middle of Rodinia; the sandstone sediment which covers the Lewisian rocks in many places (but not in Lewis) comes from the sand dunes in its desert interior. Rodinia survived for 300 million year, but eventually it broke up. One of the breaks occured 600 million year ago near the line of the Grenville mountains. Once more a new ocean formed. This ocean we know better, and we even have given it a name, Iapetus. Lewis found itself on the western shore of Iapetus, together with the northern part of Scotland and part of Ireland, and Canada. The platelet with Southern Scotland, England and the rest of Ireland was still far away, part of the opposite, eastern side of the ocean. A subduction zone formed on this eastern side, with volcanoes and island arcs, but the western side where Lewis was seems to have been quieter. When the Iapetus finally closed, the parts came together. Scotland emigrated across the sea to the eurasian plate, obtained asylum, (or perhaps the other way around) and the British Isles formed. There is still a notable stitch along the Scottish lowlands, from Edinburgh to Glasgow. The collision which closed the Iapetus formed the Caledonian/Appalachian mountains, ranging from what is now Norway to the southeast US. This was part of the formation of the most recent supercontinent, Pangea. But continents are as temporary as the oceans. Pangea broke apart, and 60 million year ago the Atlantic ocean appeared. (In mythology, Atlas was the son of Iapetus.) The break-up was accompanied by vigorous volcanism, the remnants of which are still visible on Skye, the Cave of Fingal, and of course the world famous Giants Causeway. This time, the Isle of Lewis ended up on the opposite time to the previous cycle, on the eastern shore. Mammals had by now replaced the dinosaurs of Pangea and the world was finally becoming recognizable. The rock that had formed 50 km deep had again re-surfaced. The ice ages caused more erosion, by the scraping of the thick moving glaciers, but this too passed. And finally, people came and hewed at the stone to build Calanais. It must have been back-breaking work: the gneiss is incredibly hard, as it had to be to survive for 3 billion year. The migrant humanity build their monuments out of rock that had traveled far, wide and deep, two travelers thrown together at the rim of the world. The Earth we see today is not stable. People who study volcanoes are more aware of this than most: volcanoes do not live long, often less than 100,000 year, change their appearance and behaviour, and go dormant and extinct. New ones appear, sometimes following the drift of the continents. 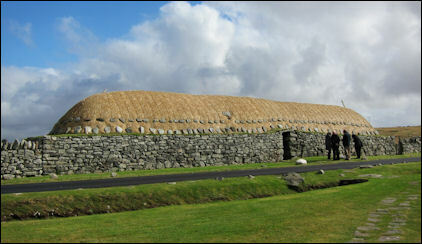 There have been many changes on Lewis in the 5000 year since Calanais was build. The sea shore has moved, the climate changed, and where there once was forest now there is moor. It is a different world. But we are not good at noticing slow change. We hanker back to a past that in our mind was a little different but a lot better. Our rose-tinted memory cannot comprehend or even recognize much of the change, and it forgets much of the past. The slow change of the Earth goes us by, until the problem of Calanais brings home the reality of change, and the change of reality. So much has changed: the landscape, the climate, the people. The people who made Calanais could not have envisaged the place it is today, and would not have recognized the land. If 5000 year does that, how different was the world ten thousand, a million, or a billion year ago? Touching the stones (which, unlike at Stonehenge, you can still do), you feel a rock that formed when the world was young. What was this world like? The stones can’t say – they do not speak. If they could, they would tell us of a world with unbreathable air, a barren land and a sea with only a few algae. But the forces that shaped the Earth were already there. Continents drifted and collided; ocean crust formed and subducted; volcanoes build mountains and erosion took them away. Rivers carried the sediment back to the sea from where it had once come. By the time the rock reached the surface, after 50 km of crust had eroded away, the Earth had changed. The atmosphere had improved but still wasn’t breathable, at least to us. Life, rare 3 billion year ago, had grown in abundance and complexity but hadn’t yet left the sea. The continents had grown. But it was not yet the Earth we know today. That came much, much later. The stones of Calanais make you think. All the changes that have happened since it was build are a blink of the eye to the Earth. The stones remember far older times and have lived through far larger changes. To them, the Atlantic ocean formed yesterday. 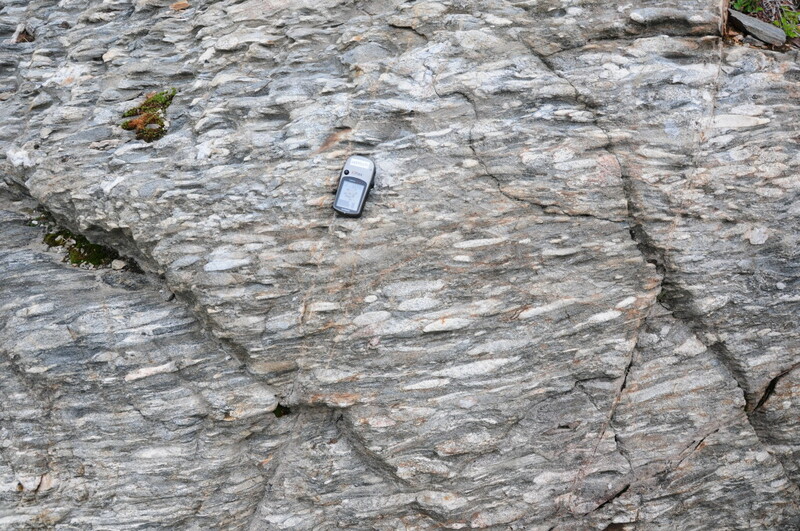 Events 2 or 3 billion year ago left their mark on the Lewisian gneiss. It remembers previous oceans, and the formation of mountains long gone. It saw England first attached itself to Scotland. The stones deserve to be noticed. Calanais is a tribute to the history of the Earth. VC now celebrates its fifth anniversary. It too has lived through changes and upheaval, slow changes and big eruptions, and has lived within a flourishing community. VC aims to help the readers and contributors to understand a little more of the Earth we live on. Like Calanais, it makes us think. Cheers! Wow! Brilliant article about a wonderful part of the world. I like the different concepts of time: a century for 10cm of blanket mire growth, 5,000 years at least in terms of human habitation and 3bn years in terms of the gneiss. It is hard for people to comprehend these, even the 10cm of mire growth is a lifetime in human terms, 5,000 years is effectively an eternity to a human being but 3bn years gives you an inkling of the age of the earth: the solar system, sol and the universe being much older still. Interesting;y these mire growth rates are quite slow: I have records of 12 inches (30cm) for mire growth in the last century in central Scotland. Just like volcanoes, some grow quickly and some more slowly and no one size fits all. Incidentally, I do miss Bob….. Wonderful article! In part it reminds me of Carl Segan’s cosmos series where humanity was born on the last hour of the last day of the geological calendar of the earth. That is why geology is so fascinating. You pick up a rock from the ground. That rock may be hundreds of millions of years old. most people don’t think of that. Thanks for the wonderful article! Nothing wrong with Appalachia. Some of the best whiskey in the world was born there. When society completely fails and skills become your only livelihood, 160 proof will be my currency. Yep . I wouldn’t be the first McCoy to use the “old Family Recipe.” if it came down to that..
It’s been a while since I was last in the Hebrides (my favourite place anywhere on the planet ! ), but when last I was there, I was walking on Skye, along Glen Sligachan. I spent that night near Camasunary, overlooking a double stone circle (Dun Ringill?) near a croft. 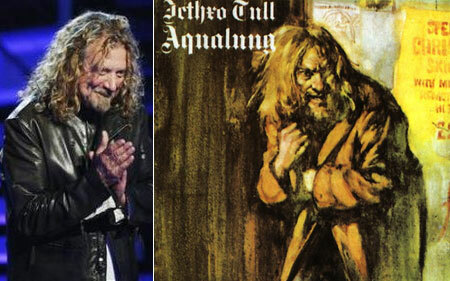 I believe that is land owned by your namesake, one Ian Anderson, of Jethro Tull. He chose well. What a wonderful place to live. Awesome article, I almost feel like you could add some music to parts of the text, and then end up with a kickass heavy metal song. Maybe a pibroch would be more appropriate. But bagpipes, like haggis, are something of a minority taste among non-Scots. If it wasn’t for the fact that I’m recovering from a serious concussion, then bagpipes would be quite ok. Haggis is great though. If the haggis is well peppered I am game. Lame haggis in just boring. And nothing makes the blood pumping like a big horde of mad pipers blasting away with drummers. I get a bagpipe moment about once every week when I just need to listen to it and dream that I am standing on a rock wielding a claymore. And to the best of my knowledge there is no scot in me. I have a stolen French woman and a stolen dutchman in my lineage, there is also a Finn down the line who came walking straight out of an epos. Skye rather than Lewis, but the Stormwatch album by Jethro Tull seems very much born from that landscape. I listened to this daily on the island whilst driving around the island. It just fits so well with the landscape. Now even I can tell the difference between those two. Wtf…The guy on the left lives about 5 miles away, and has been a customer in my shop. A friend of mine occasionally plays guitar for him ! In fact , the last time I saw him was coming out of a chip shop in Bewdley as I was going in. Viking and heavy metal, i got it! if you need more metal im your man ! When I was a lad of about 12-13, we used to take family holidays on Iona, (Inner Hebrides) which is mostly gneiss. I can vouch for its hardness – these bewhiskered stalwarts of the Geological Survey who mapped it in Victorian times must have had awesome strength and stamina. There were a couple of oddities on the island which I’ve never seen explained. First off, the Iona marble (once commercially quarried) – a pod of white marble shot through with blebs and veins of green serpentine. And at the other end of the island a thick vein of graphite (allegedly; how they found it I don’t know,since it’s on the shore and erosion has cut a long deep trench where it was). I’ve often wondered what the pre- metamorphosed material for these was. Thanks for a wonderful post. Makes me want to go back there. In summer, not at this time of year, though! The Anderson is my grandfather on my father’s side, tgmccoy, so I imagine we must be related through some time in the past. I’m a scot/viking too. I think its Sutherland as my grandfather told me, when I was a lot younger. Sadly he his no longer with us, but one day I will rejoin him when its my time. Brilliant article Albert, and happy birthday to volcano cafe. I mostly lurk, and have been since eruptions, and then Jon’s site, and then volcano cafe. I still visit eruptions with Eric, and Jon’s site and also volcano hotspot as well as here. I love learning from you all. Keep up the good work, engaging with people who are interested in science and mother nature in all her forms, but didn’t think of doing it at school or college and want to learn. Someone asked the other day about the fact that the long-term HVO data on Mauna Loa hadn’t been updated to include 2016. So (correct me if I’m wrong) I took the current data from this year and roughly added it. The monthly earthquake addition is in red (there were 57 in July) and the distance change is in blue (70 cm this year). Hm, that looks “boomish” to me. 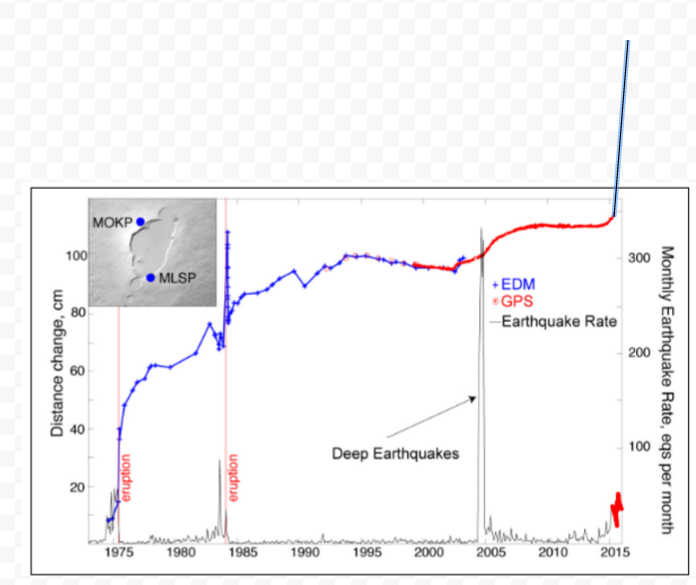 If we compare with the intrusion that lead to the 1975 and 1984 eruptions we see a system that is highly charged by now, and with increasing numbers of earthquakes I feel pretty confident that we rather soon will see this volcano in an eruptive state. How did you make this? On the recent data, the lengthening since June has been a centimetre or so, within range of the average per year since 1980. OOPS! I took the vertical motion (about 70cm) instead of the cross-distance change (about 7mm this year). I wish I could take that back. If you upload a new picture, some admin can probably update the link in the comment above to point at te correct one. Thanks to Glenn Rivers on facebook, I was able to find the dome on Google earth. Considering there are trees and other foliage growing on top of this (and in some places, on the sides) this can’t be a new feature. That necessarily doesn’t mean it isn’t actively extruding, it could possibly be pushing upwards with renewed activity below it, but I still wouldn’t consider this likely. But is that the same? Remember that there was one that plopped up 500 years ago, that looks more like it. And the shape looks different. I guess we will have to wait for the answer from the relevant authorities (I have emailed them). This is the one Glenn pointed at. 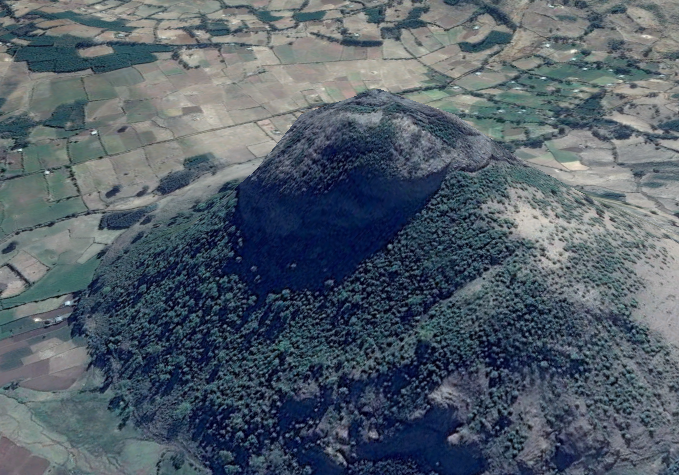 I have no clue if this is the same, but looking around it on google earth, it did look quite similar, but it’s tough to say. I was just approaching it from the perspective that he knew for sure which dome it was from the video. I know there is an old one in the neighbourhood, but I am far from sure either way myself. I just wish we get an answer soon before I go bonkers and fly out myself. How do you know they aren’t lichen covered sheep? Yeah, it’s a textbook example of damaging straight line winds in a downburst setting. Possibly enhanced by (severe) bow segments in the squall line itself. Seems that a line echo wave pattern formed along the cold front. We dutchies are experiencing the same cold front atm, top wind speed record so far is a 127km/h gust at the Den Helder station, will probably be the highest in this front passage with it being located at the northwest coastline. That looks like a tornado to me! Especially the photo of the concrete bollards ripped out of the ground. Tornadoes a surprisingly common in the UK. I expected to hear reports of tornadoes as soon as I saw the squall line on http://www.raintoday.co.uk . The Kensal Rise Tornado passed over my flat and took a chunk off several houses. Looking at the picture, I am not sure the bollards had been concreted into the ground. It looks almost as if they had just been put on top, with tarmac used to paper over the cracks. A flying bollard must be a particularly lethal weapon of mass destruction. So, having said that. I suspect that what happened was akin to a Derecho. Only by damage analysis of the debris patterns can you really tell for sure. One thing that is pretty common after a tornado (at least where I grew up) is to try and figure out which trees came from what holes left behind. In 1994, we came up with more trees than we had holes. 9 miles away, at the church, they had the opposite problem. They had more holes than they did trees. I’m not saying that is where our extra tree came from, but it is fully within the capabilities of a tornado. A gazillion years ago, when I was a teenager, a tornado lifted a concrete slab bridge from next to a strip mall. We never found out where it landed. That’s a pretty large chunk of concrete to have disappear in a storm. My Dad’s theory was that it landed in a swampy area and became submerged in the muck somewhere. they jacked it up did some repair, and used it as a stock barn-it is still there BTW. I like that. It points to the resourcefulness of the people. Sure, we may all be treking down the devolution path of Homo Stultus, but when opportunity knocks, you make it work for you. 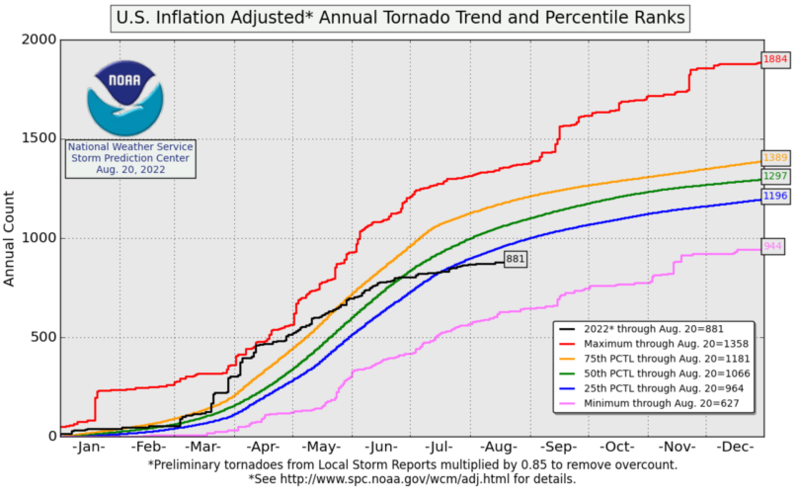 Current trend in the US is below normal tornado incidents. I’m pretty definitely sure it wasn’t a tornado. The sounds like thunder booming that preceded it were strange. Some people said they sounded like bombs going off, or very deep thunder sounds which made the earth vibrate. It hit a wide swathe of the coast. I think you’re right about the bollards though. They ended up in the mess of a caravan so probably got taken with it when it took off. Two of the tall floodlights on the football pitch were flattened. I’d say it lasted 10 minutes and anyone out in it had to crawl to shelter. That sounds impressive. Can you clarify any further please, Stef? Not stef, but I can tell you that the regions downstream of the bow echo are likely tornado genisis areas as the air streaming along the front turn in towards the advancing front. No ref link, just been watching them for a lot of years. Another source for ultra strong down bursts are the “rear flank downdrafts” of tornado capable storms. I’ve seen tv weather twits misidentify these as actual tornados on radar when they are a trailing feature of the storm flow pattern associated with an actual tornado. “Rear flank downdraft” is an actual term used in meteorology and it does yield a few nice links about it when you search on the phrase. Btw, the bow echo is caused by part of the advancing front pushing out ahead of the main squall line. And a better explanation than I can provide. Thanks to everyone that works hard to keep this site so very interesting! I can imagine this story becoming the lyrics to a brutal death metal song…. Lock and key-well corroded by the sulfur…. And very Ill tempered domestic geese. There’s a whisky distillery in Scotland where the whisky warehouses are secured by a flock of guard geese. And no it’s not a joke; they’re entirely serious. Can be really aggressive birds. FYI, Small shallow swarm at Goðabunga. This is actually the first promising swarm out of the entire bunch in the last couple of months. 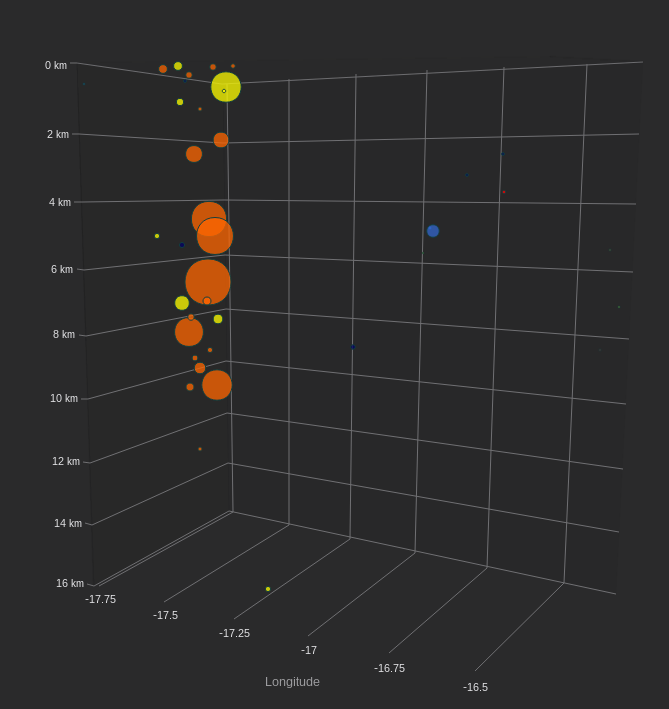 Well yes… location… and NOT all extremely shallow! Yepp, that is why I am more interested this time around. mine was working overtime on this one..
BTW we called it a day.. Reply to Alyson’s comment above..
That..is an impressive story! And a hair raising experience. I’ve had a couple of heavy windshears at low alt, but fortunately never a downburst like this! Glad you lived to tell the tale! Fire retardant is always funky to deal with. Here is an AFFF discharge gone wrong. Years ago, I was standing deck watch during a yard period when a white glob of foam came walking up to the quarterdeck. The blob of foam presented an ID and requested to come aboard. It turned out that the white blob was one of our crewmates who had been at a test of an AFFF foam applicator nozzle, and had fallen into the discharge tank. Dunno what Santa Clara’s foam is made out of, but one version uses fish derived proteins with a stabilizer. Makes a great chum. 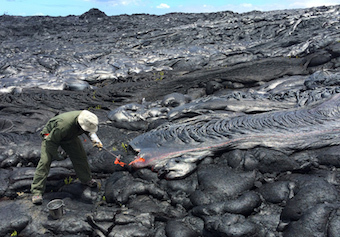 And this is how it looks when a volcanologist plays lip-banjo (it is friday after all). Yes, that’s the right one. Thanks! Another stronger M4.0 quake at 04:50 depth 6.4 Km, about same location with several deep after shocks. Building up to something soon? Nice link. Via a link off that page – Mt St Helens magma source was likely from the vicinity of Mount Adams. Hansen, S. M. et al. Seismic evidence for a cold serpentinized mantle wedge beneath Mount St Helens. Nat. Commun. 7, 13242 doi: 10.1038/ncomms13242 (2016). Hmm, so I wonder why Mt Adams has such a contrast in activity to St Helens in terms of explosivity and frequency of eruptions? Just guessing here, but the edifice mass may push the lithospheric stress higher on less permeable rock and the melt takes the easier path along strata boundaries. Something similar may have happened at El Heirro when the vent under Sabinosa didn’t pop even though deformation pointed at it being “next”. The magma (by pure luck) found a route to the west and erupted offshore instead of killing that town. Mount Adams is an occasional big erupter, with much less in between episodes. The last episode ended 30,000 yr ago. Not sure why, but I would guess the magma chamber here is rather deep and needs high pressure, build up over a lot of time, to break through to the summit. St Helens only grew large very recently. The overpressurised Adams chamber started to leak toward St Helens. Ehhhhh i don’t think material breaking through is a problem. Mt adams has dozens and dozens of flank vent eruptions, and sits right on the spine of cascade volcanism. It’s volume of eruptive products isn’t small either; it really is a monster sized mountain. Adams erupts almost exclusively andesite, so the magma plumbing beneath the volcano likely isn’t, ermmmm, constipated. St. Helens runs the full gamut from basalt to rhyolite, though most of the cone-building products are dacitic. Also, sitting right between the two is another volcanic field: Indian Heaven, which is a line of mainly basaltic shields. So whatever the shared magma source is, there’s enough distance between it and the surface for the magma to evolve very differently. The region is surprisingly more complex than two stratocones next to each other on a map. If you roll the clock back 400ka or so, you have volcanic activity all the way from the vents around Portland and the Boring lavas all the way east to the Simcoe mountains, east of Adams, along with Hood, Adams, and vents in between. That makes a band of volcanic activity over 150km wide across the arc. I’ve seen speculation before that this is due to some kind of damage or tearing of the underlying plate here. Looking forward to getting time to digest this paper. Same thing that happened at Kistufell, the heavy and solidified top above the magma chamber was a to tough nut to crack so instead a dyke formed along the fissure swarm and hot fresh magma ended up in Bárdarbunga where the plug was to hard to break through so the magma in turn crushed the side of the magma chamber and it formed a new dyke or reheated an old dyke and Holuhraun happened. So the idea that St. Helens has a magma source close to Adams is not out of the question.. If I can find that paper I’ll post it..
not the paper, but good snapshot..
Pre Viking Swedish style. Circa 9000 ybp. ‘Using the Blue Waters supercomputer at the National Center for Supercomputing Applications at the U. of I., one of the fastest supercomputers in the world, Liu’s team created a computer model that replicated both the plate tectonic history of the surface and the geophysical image of the Earth’s interior. This study is the first to use a high-performance supercomputer to interpret the layers of complicated geophysical data underlying Yellowstone, Liu said. What pray tell, Dr. Liu-barfed lava all over NE Oregon, Galloped down the snake river valley into Wyoming? I’ve had the thought that Yellowstone could possibly be a byproduct of ending of the subduction of the Farralon plate. Most volcanism caused by that flareup ended around 30 million years ago, but there are still remnants, and I wouldn’t be surprised if Yellowstone could be one of those lasting remnants. The reasoning I have behind this is the simple fact that the timing lines up quite well, and as of right now, the current location of the Yellowstone hotspot is actually pretty close to the edge of the sunken Farralon plate. The question in this hypothesis however is why Yellowstone is such a specific locus that has remained highly active, where other areas of the sunken farralon have gone quiet. They have calculated how a mantle plume can get through the subducting Farallon plate, and conclude it can only manage this where the plate tears as it bends down. The model actually fits the origin of the Yellowstone track very well: they get a eruption site near Steen mountain 16 million year ago, with volcanism spreading north south and east, exactly as happened (see the post on the Snake river). But after this, the plume refuses to create a track. It doesn’t have time to re-establish itself: in their calculations that takes 30 million year. I think their model requires that the Yellowstone hotspot track after this is due to shallow heat, located above the Farallon plate. That may be possible. There is no dispute that there is hot material underneath Yellowstone: the dispute is about its depth. But is the Farallon plate just subducting or did something very big bash it down, vertical-ish, as it appears to me may be, just possibly, the case? The Farralon plate has already completed full subduction. Ever since being fully pushed beneath the north American continent, it started then crumpled, and in a lot of areas, started to sink down. I’m not sure about what specifically causes plates to sink, but I would assume it would be related to buoyancy (although that brings up the question why they wouldn’t sink when they were on top of the ocean floor). Either way, when a subducting slab sinks like this, it leaves what is known as a slab-gap. When it sinks lower, material above it must rush-in to fill the gap, which is theorized to create a major heat and magma source in the shallow mantle. This is the predominant theory as to why there was a big flareup of supereruptions across the American southwest from roughly 35-15 million years back. 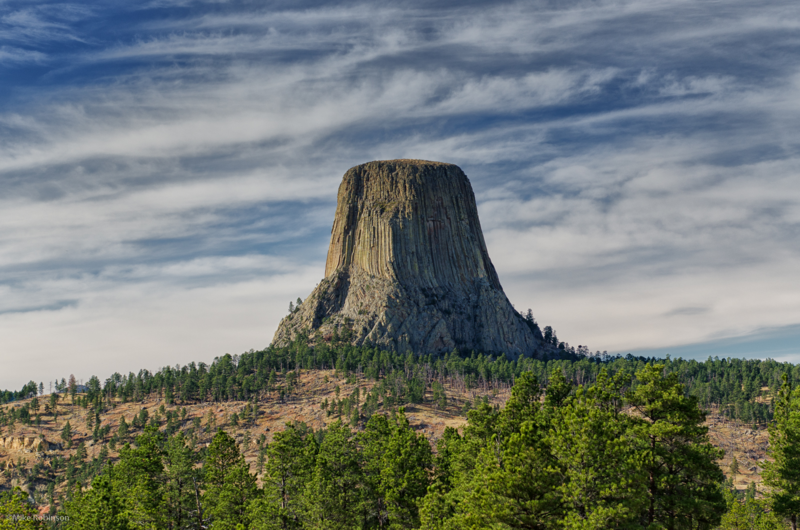 Unfortunately, that still leaves a lot of questions regarding Yellowstone. I’ve always said that despite its popularity and how well studied it is, Yellowstone is one of the most mysterious volcanoes in the world. It’s the only big-time supereruptor that doesn’t have a subduction zone feeding much of the magma production (although, you could easily argue Iceland or Africa as supereruptors themselves, they just don’t do it all in one big blast). Further, there are the eternal questions of whether it is related to the cause of the Snake River Flood Basalts. Note: He’s only half Lab, the other half is meat grinder. Eventually… he’s gonna get that squirrel that hangs out in back. I keep him up to date on his shots specifically because at some point, he will succeed. The neighborhood cats have already gotten wise to his presence and avoid the yard. When 92 lbs of snarling teeth spring out of nowhere, you keep a mental note of where that is at. I’m not overly fond of cats, but I don’t hate them, and I do respect their ability to (sort of) learn. Wife’s been given this miniature Poodle. A friend of ours passed away and her daughter gave her to us. Wife’s had several . This little dog is absolutely the smartest dog I have ever had. home with her -our old Springer(no dummy, either) growled at her. puppy play position as to say “Alpha!” . That was it -no worries. She treed him today and I had to call her off, by grabbing her..
…well, poodles were originally a working breed, used for hunting. Good work, Ian. I still think that something in that area is going to happen in the next few years. Maybe another fissure-type or maybe along the same one again?? Regarding the first map, the scale of the EQs seems to be off. Live stream from NHK http://www3.nhk.or.jp/news/live/ looks like they are waiting for the tsunami, and boats are going out meet the tsunami in open water. Scary stuff! One can watch the harbor draining out of water right now and you can hear the sirene going off. Lets hope the wave is not going to be too big!! But, local fluctuations can still occur for a few hours. Let’s hope that there are no casualties and little damage done. A very late hurricane in the Caribbean, and the models seems to show it crossing over Pacific as a tropical storm. I didn’t know they could do that. Will it keep its Atlantic name if it appears in the Pacific? Yes, if the low level circulation remains intact. If this dissipates and the storm reforms over the Pacific from the mid level circulation, the storm is given a name from the E Pacific list. The latter is quite common but I know that the former has happened occasionally but I would need to look this up. Otto is the first since name changes were not mandatory. Relating back to the earlier Yellowstone origins discussion, here is something I made in the past that somewhat visualizes why I believe that Yellowstone may be a remnant product of Farrallon subduction. In the above image, I took an overlay of a tomographic image of the sunken Farrallon plate, then overlaid it with a map of the United States. 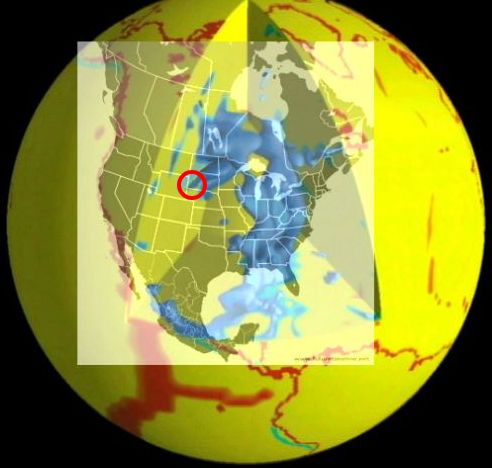 The red circle is the location of Yellowstone, which lines up at the trailing end of a finger of the imaged Farrallon plate. The question is whether that’s simply imaging of the hotspot plume rising, or if it’s a remnant of the Farrallon that is stretching more vertically. Sorry, ignore the above link, broken. Happy anniversary VC. And many thanks to all who make this website possible, especially those who work behind the scenes and write the principal posts. Ad multos annos! Offtopic to climate science, to discuss some other ongoing dramatic set of events. It is quite extraordinary that the Arctic has been so severely warmer than average in recent weeks. Just look how mild is the weather now in Svalbard but at same time the disrupted patterns are pushing severe cold southwards. Not just Scandinavia is unusually cold, but especially Siberia. This Arctic disruption could result in an extremely unusual winter for the North Hemisphere, but I guess that no one is really sure of what this means. Anyone wants to speculate on what this means in terms of weather patterns and upcoming winter for the North Hemisphere? One could hope for a deep freeze with plenty of snow, during actual winter and not april-may…haven’t had that in a while (would also do a serious number on all the rats that been produced in this record warm year). We had people getting sunburnt in mid october here in the Faroes which is def outside normal. Danish weather prophets said earlier in the week, that the patterns we are seeing now are somewhat similar to what happened in winter 09/10 which gave insane amounts of snow in many places in Europe, and a generally cold summer for most of the nordics in 2010. But with the caveeat that they could be absolutely wrong. The jet stream is the most likely cause: it is rather weak at the moment and may not give a barrier against the mixing of warm and cold air. Warm air gets north, cold air escapes south. Ice cover is also very low, and warm water can heat the air much further north than it usually does. The north atlantic gets a lot of its energy in the winter from the warm sea water. New post is up! What’s wrong with New Zealand. Happy Anniversary and slàinte, VC!